AKA, National Novel Writing Month (NaNoWriMo) or National Blog Posting Month (NaBloPoMo). It is about writing every day. To either crank out an entire novel or 30 consecutive blog posts. I am not a novel writer (nor do I have any aspirations therein), but I am a blogger and I have completed two NaBlos. Oy. The second one made me swear them off entirely. I became downright sick of myself! My theory is that NaBloPoMo is especially good for bloggers who need a push, who have fallen off the blogging wagon and want to get back on, or maybe newbies who are looking for the learning and networking to be gained. So, perhaps you've planned ahead, plotting out what you will post each day of this month. Or maybe you decided to take the plunge at the last minute and are flying by the seat of your pants. I may not be participating, but I do have ideas that might help YOU if YOU are in the midst of this challenge! 1. Make a list of every blog hop/link-up you know of and might like to join during the month. Better yet, open whatever calendar you use (you do use a calendar, right? Google...?) and enter them into the days of the week on which they occur. On those days, at least, you have a blog topic. 2. Do a search for "blog writing prompts" or simply "writing prompts". Pour over them and write some down, or open a draft and start a new post or two with some notes on the idea you have. This is my favorite way to remind myself of things I want to write about. I've been known to run up to my computer as soon as an idea has popped into my head, in order to not forget. 3. Look up daily/weekly/monthly observances, and choose one or two that you find interesting. Such as Origami Day, World Kindness Day (tomorrow), Homemade Bread Day and Have a Bad Day Day. Hey, perhaps on that last one you could write a rant post! 4. Are there any birthdays or anniversaries in your life during November that you could post something about? Are any of them milestone years that deserve a special mention? 5. Read any good books this year? Books are a great thing to talk about. You can gush over one that you loved, and help someone else discover something new at the same time. 6. The Holidays are coming. There is SO MUCH to write about when it comes to that! Black Friday/Cyber Monday: Will you be shopping or skipping the chaos? Why? What's your holiday shopping strategy? Advent: Is this a tradition your family observes? Which specific holiday do you celebrate? Why? What are your holiday plans? Will you be travelling? Got holiday travelling tips? 8. Speaking of pictures, they can spark writing ideas, or be a post all by themselves. Lots of bloggers like to post for "Wordless Wednesday". I strongly encourage you to use your best quality photos, watermark any you wouldn't want someone to steal with your name, blog URL or something and publish them LARGE. Maybe it's just me, but I hate trying to look at a tiny picture when there is plenty of room in the blog post space for it to be bigger. 9. Pay attention to current events and what's trending in social media. Perhaps a topic will spark something for you. Maybe you have a strong opinion about something? 10. Ask your readers and social media followers what they'd like to see you write about. Trust me, this can be very helpful! 11. Do you know how to do something that you could write a tutorial on? If so, include pictures! Or maybe tips on surviving ________ (like this post). Figure out what time of the day is best for you to post. Perhaps schedule your social media promoting posts (I'm not a huge fan). If you miss a day, don't give up. Maybe try to post two the next day, or even just say, "Oh well, I missed a day" and move on. Get away from your computer regularly. Drink copious amounts of coffee and keep your favorite treats handy. Keep pushing through that last week. By that time, especially with the Thanksgiving weekend, you will feel so done. But you know you want to be able to say YOU DID IT! And you CAN do it. There will be times it feels like too much work. Maybe you'll think it's not worth it for whatever reason. But like I just said, if you see it through, at the very least, you will have the personal satisfaction of being able to boast about the accomplishment. Now go forth and blog your heart out! 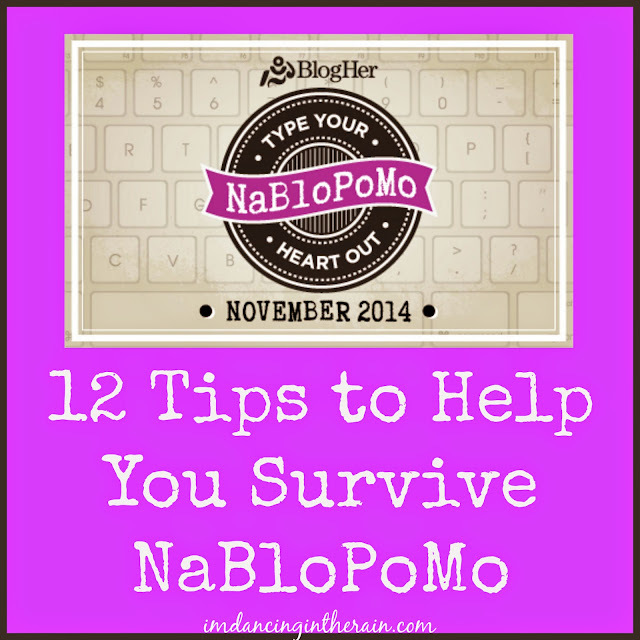 Are you tackling NaBloPoMo? Do you have ideas I didn't think of?